WEC Group's MTL deal saves 135 Jobs! We have funded a partnership deal to acquire the business and certain assets of metal manufacturing specialist MTL Group saving 135 jobs. The administrators of MTL Group Limited chose the deal we offered as the best option to bring the company out of administration. The deal allows the South Yorkshire company to move forward with us as a new, major force in the UK's fabrication and engineering sector. MTL Group entered administration on February 2 after suffering the loss of a large overseas defence contract. It has remained trading as administrators EY looked to secure its future. MTL Group's sales director Karl Stewart, finance director Howard Kellett and operations director Darren Bradley remain in the senior management team following the creation of the new partnership with us. Wayne Wild, our group commercial director, said: "We are delighted to have reached an agreement which will save the jobs of more than 135 workers in South Yorkshire. "We are looking forward to continuing to work with the current customer base whilst securing new orders." The addition of MTL Group more than doubles our engineering capacity and we will now have almost 600 staff working across eight sites in Lancashire, Yorkshire and Merseyside. Karl Stewart, sales director of Rotherham-based MTL Group, is excited for the future and the opportunities that now exist. He said: "The synergy with WEC Group is very strong and this deal makes both businesses much stronger entities. "MTL Group has certain specialities that WEC hasn't been involved in which can now be offered to their customers, including our large laser cutting and bending capabilities. "And WEC Group has operations and areas of expertise that we haven't been involved in, such as its new powder coating division. The additional capacity is another massive positive that comes out of this deal." John Sumpton, joint administrator of MTL Group and executive director at EY, said: "We are pleased to have secured this deal for MTL Group, which safeguards the future of 135 employees and represents a strong strategic fit for WEC Group. 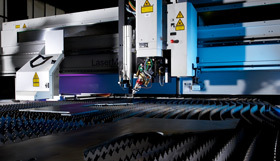 The partnership makes us one of the largest laser cutting operation in the UK's fabrication and engineering sector. We have a turnover of more than £35 million and MTL Group currently has an order book of more than £20 million. 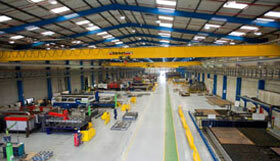 MTL operates from a 300,000 sq ft capacity factory in Rotherham which more than doubles our overall manufacturing space. 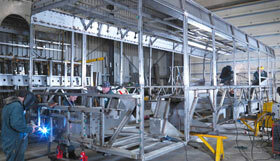 It will also increase our purchasing power and ability to handle larger metal cutting work. Wayne Wild added: "MTL Group is a really great fit for our business. The company has a great track record, working with big name customers and has an impressive order book, despite the problems it has had. "This move greatly increases our metal purchasing power, and it will also allow us to offer MTL Group's expertise to our growing customer base whilst giving its customers access to the work the wider WEC Group can deliver for them. "The partnership with MTL Group also makes us the largest laser cutting operation in the UK, with 18 laser cutting machines servicing our clients. It means we can offer all our customers more." MTL Group's manufacturing facility includes laser cutting and bending, high definition plasma cutting, waterjet cutting, gas profile cutting, robotic plasma tube cutting and robotic bending. It also carries out CNC machining, fabrication with robotics, and has semi-automated and manual welding stations. Founded in 1995, at its height MTL Group processed and fabricated 30,000 tonnes of steel annually. Still privately-owned we are one of the largest engineering and fabrication companies in the UK and have a 35-year track record in investment and job creation. We invested £500,000 in the latest technology earlier this year to set up a new job-creating powder coating operation in Darwen. Formed in 1979, we have an extensive customer list across a wide range of industries including rail, automotive, nuclear, offshore oil and gas and aerospace and we have also purchased a six acre site at the Walker Business Park in Blackburn for future expansion. Our manufacturing ranges from footbridges and bus frames to street furniture across 14 divisions, and with operations in Darwen as well as Blackburn, Knowsley on Merseyside and Leeds. Steve Hartley, founder and managing director, said: "In 35 years of trading we have always grown the business in a strategic and sustainable way. "Adding MTL Group to our family is a logical move for us and for MTL and we look forward to the future with confidence." We also continue to invest in the future, with the only in-house welding and fabrication training academy in the country, ranked in the Top Three in the UK as an apprenticeship provider. Fourteen per cent of our workforce is now made up of apprentices as we work to tackle the skills shortage in the industry. For more information, please visit the MTL website.